The other day I sat at a local café with a new friend in Inverness. After some brief pleasantries and the usual catch-up, our conversation turned to self-care. Although a few years younger than me and still a student, I could relate to her struggles. Struggles of trying to balance work, school, ministry, and friendship. Thoughts of wondering how to be a leader when one is not offered actual leadership development courses. The constant tension of how to maintain and make meaningful time WITH God instead of just FOR Him. I remember well the days of burn-out that I’ve faced. I burned out of school, church, and ministry placements (whether paid or voluntary). Burn-out has affected my physical health, my mental state, and my relationships. I remember in seminary trying to do a full course load, working 3 part-time jobs, and also volunteering once a week on top of trying to keep up a rigorous social life. In the end of the day, the thing that should have been the most exciting and fulfilling to me (time with friends) actually ended up just further draining me. My friends became frustrated and resentful saying that I was no longer fun to be around. Since I’ve started my full-time disability ministry five years ago, self-care has become a large facet of my life. I’ve read a lot of books on it, talked to various ministry practitioners, and even took a week off work to take an academic course “Self-Care In Ministry.” So when April (a woman I consider to be a friend due to our shared online presence) asked me to review her book, I was delighted. Self-Care is an avenue that Yamasaki is clearly passionate about. She has written extensively about it on her blogs and in other books, and it is clear that this is something she very much considers vital to her ministry. Like I said, I’ve read various books on the topic, so what makes Yamsaki’s book stand out to me compared to the other literature I’ve read? To be honest, there are a lot of self-help books on the shelves at libraries and in bookshops. Most of them are helpful, articulate, and practical. Yet Yamsaki’s book furthers the conversation and adds a new element of depth and dynamism. Scripture tells us that we are to “love the Lord your God with all your heart, soul, mind, and strength” (Matthew 22:37) and Yamsaki delves into how it would look if we practiced all four of those areas in our self-care. Calling them the “Four Gifts” Yamsaki shares stories, practical suggestions, and illustrations about how community, soul-care (including reflection and lament), engaging the intellect and even how we choose to relate to food, exercise, and sleep can lead to a more fulfilling relationship with God. Furthermore, she explores areas of cultural relevance to our time such as responsible usage of social media and online presence and the growing mental health and sleep deprivation concerns sweeping our world and our nation. She writes from a Canadian viewpoint (which of itself is great, we need more Canadian authors), but her kernels of wisdom can impact anyone regardless of country. What I particularly appreciated about Yamasaki’s book is that she does not have a “one-size fits all” approach. She recognizes that some suggestions may work well for some and not for others due to various factors. She realizes that self-care may mean eating a slice of chocolate cake one day and choosing to eat vegetarian the next. She exerts that some days self-care may be about NOT doing one’s usual self-care techniques whether journaling or drawing. It is in that sensitive space of permission that I find a desire for self-care is born. Self-care shouldn’t have to feel like a chore, but sometimes it is about actually doing the chores around the house. I have always appreciated anything written by Yamasaki and this book is no exception. I really love April’s intellectual and scholarly mind coupled with her incredible passion and fueled by her pastoral sensitivity to truly care for her readers. This is a book that I am excited to share with my friend and with any other young church leaders I meet. I feel many would benefit from the wisdom and depth of insight she imparts to all who are willing to be taught. Yesterday, I had the incredible privilege of seeing the brand-new movie “The Case for Christ.” To be honest, I was a bit skeptical before going to see it. Of course, I believe in the resurrection of Christ and all the scientific data proving that He was a real person, that He lived and died, and also that He is Lord and Saviour. However, I was a bit more skeptical of how they were going to pull it off. Lee Strobel is a brilliant mind and an incredible thinker. He is a great person to read if you are interested in scientific data, and logical reasoning. But, I wouldn’t say he’s necessarily the kind of person you would rush to for Saturday afternoon amusement, I was wrong. The new “Case for Christ” movie is an incredible conglomeration between a documentary and a life-story. I believe it fits well into the category of “docu-drama.” The story unfolds Strobel’s life as a former ardent atheist who was shocked and upset when his wife, Leslie, became a Christian. Strobel set out to prove her faith null and void in the attempt to “win her back.” Yet, in the process, Strobel discovered that there was overwhelming evidence for Christianity and became a Christian himself. The movie focuses primarily on his testimony and progression to the faith, however, not without adding in some of those extra punch arguments that would be sure to convince even the hardest skeptics. Later on that day, I attended a Good Friday musical production at a local church and picked up a free copy of “The Case for Easter.” Although I am quite familiar with the name “Strobel” I have to admit, I have never read any of his works, but the movie definitely made me interested in finding out more. So when I got home I immediately began reading and just finished the book a few hours ago. Strobel’s work is once again filled with strong evidence that the crucifixion indeed happened, that Jesus did die, and that the best explanation for His disappearance is that He was raised to life. Yet the real clincher for me is the way it impacts the way I see Christ. I have heard about the crucifixion for years and I am well aware that it is a horrendous process to go through, however, hearing how Dr. Robert Stein, a leading forensic pathologist describes the ordeal really puts Christ’s love into perspective for me. It is truly a sacrifice that none of us are able to compute because likely none of us would be willing to endure it. And yet Jesus did, not for His friends, but for those who were “far off” and “enemies” of God (Ephesians 2:13). Even though the movie and the book were both amazing, my only concern is that many atheists have simply closed their hearts and minds to these very arguments. I do find it encouraging and refreshing to see that even people trying to prove Christianity wrong often end up believers (including C.S. Lewis), but still for some individuals no amount of evidence will steer them towards Christ. They have determined not to believe, and they are not interested in anyone trying to convince them otherwise. Strobel’s work is a great engaging message for anyone willing to “spar” with claims of truth, but to do so, I think there still has to be a significant amount of curiosity. Something that simply isn’t there in the “truth is relative” day and age. Nevertheless, I applaud this new work and think it is a movie that will likely help other Christians formulate and articulate their own thoughts and arguments better. I also am elated that in the last few months two blatantly Christian films “The Shack” and “The Case for Christ” have hit the theatres. We often do not get many Christian films out and that two were released almost simultaneously is a great blessing. Our world is still very much going in the direction of post-modernism and a disinterest in the Christian faith, however, the fact that Christian movies are now hitting Hollywood a bit faster does leave me with a bit of a question. Is it simply a mere coincidence or might there be something deeper? Is it simply that Hollywood jumps on Christian films at Easter, or might it be, that deep down people are crying out to fill this spiritual void and are willing to go to any length to find it – even if that include a bag of popcorn in one hand and a can of soda in the other? What do chickens have in-common with the day-to-day reality of family life, courage, and compassion? What can these seemingly unintelligent animals really teach us about conviction, love and loss? In Kelly Chripczuk’s brand new book “Chicken Scratch: Stories of Love, Risk, and Poultry” she recounts her experience as an active mother of four, a pastor of a thriving congregation, and a chicken farmer. These pages are filled with the raw honesty of the ups and downs life throws at us, but are also graced with a sense of pastoral wisdom and humour. Throughout her book, Chripczuk invites us to journey with her as she makes new discoveries, rekindles old ones, and ultimately falls into a rhythm of life that promotes balance and well-being. Through her own search for what is right, she encourages her readers to find grace and strength in the sacred and in the secular, in the marvelous and in the mundane. This book started as a journal, a commitment to pay attention and write as often as I could during the first thirty days with our new flock. I wrote nearly every day from the first of May to the first of June, 2016. I paid attention to the way life with the birds intersected with my own life and family life. I watched the way I behaved with the birds and how I thought about them. I listened to my life and discovered the questions I would have to answer and decisions I needed to make to be able to embrace a life I love. Not all of my writings made the cut and much in the form of details and explanations were added later. I watched the chickens, watched myself and listened for the nudge of God in the intersections of my life. And while I don’t often write directly about God in the pages that follow, I’m convinced that the presence of love, grace and joy on these pages means God is here just as clearly as God is there in the longings, confessions, hopes and angst of the Psalms. I’m still in love with that brown eyed boy and this past spring the world was again blooming fresh and green around us. Sleeping creation woke from its winter slumber and I stood for a while at the crossroads of love and risk where heaven and earth meet, waiting, watching and giving witness. What is the most completely crazy thing your heart is calling you to do at this particular moment? It might be an action or a career path that everyone around you discourages you from. There might be plenty of external (and even a few internal) opinions and viewpoints that are pressuring you to change your focus and direction. But just like Chripczuk discovers, finding a path that we love and then gaining the courage to continue down that road makes our lives so much more vibrant and interesting. If you’re looking for a fast-paced, funny, easy-to-read book but also one with a lot of depth and that will challenge you gently, I highly recommend “Chicken Scratch”! Recently author and song writer Carrie Newcomer released a new book filled with poems, prayers, speeches, and lyrics from her latest album “the Beautiful Not Yet.” Newcomer’s work could not have come at a better time in my life. Recently, I have been going through a significantly painful transition. I’ve had to leave a job and way of life that I’ve loved being part of for the past 3 years in order to embrace the unknown. With no knowledge of what’s next it’s easy to become discouraged, discontent, and depressed. Listening to and reading Newcomer’s work has been a breath of fresh-air and allowed me to shift my focus. Newcomer whose spirituality deeply encompasses the Quaker values of peace, solitude, and simplicity, offers loving, honest reminders of God being present in the secular and the sacred, the marvelous and the mundane. Her writings portray an honest sensitivity and deep emotional connection with her readers as she ventures into issues of aging, ill-health, and transition. We joyfully join her in her gardening metaphors and marvel at her artistic grace in explaining painful daily realities. Newcomer sings with a rich, strong acoustic-jazzy voice with poignant lyrics and smooth vocal energy. Her work is profound not only as poetry but as prayerful artwork – a tapestry of taize, a dance of delight. I was given a complimentary copy of Carrie Newcomer’s work with no obligation to write a review (whether positive or negative) about her work. Yet, I can honestly say that this CD is one of the few where I listened to it multiple times, pausing and rewinding just to get the full feel of her words. I hope you will also consider getting a copy for yourself and seeing the wonders that this album can bring to your heart and the strength it can bring to a weary soul. The following is a personal review on the book: Women & Leadership By: Malcolm Webber (Strategic Press, Bentham, Indiana, 2007 ). The following views are my own taking into consideration Webber’s writing and referencing him often. I have not been commissioned by Webber to write a review or to post any blog on his material; so any recommendation on my part is completely voluntary. Well, I never thought this would happen, but I have finally found a book about male headship in ministry that I thoroughly agree with, appreciate, and embrace. Malcolm Webber is actually the senior pastor at the church I attended for young adults when I was a seminary student in Indiana. I only met with him once, but I remember he gave me his book, “Women & Leadership”, when he heard I was studying to be a pastor…and for whatever reason I never opened it until just now (I was probably scared of it pointing me away from my studies). Now that I’ve read it, I realize that it doesn’t invalidate my studies at all, it just proves more and more why we need more women to study the Scriptures, but also why we need more men to take up their God-given and God-ordained position as leaders within the church. Webber’s style is both highly theological and practical. He’s given consideration to all of the major Biblical texts about women in leadership (both from the Old and New Testament) and he’s arrived at a fair conclusion that I think we can all agree with. Men and women are created different yet equal. A man’s role as head of the family and of the church is suggested to us throughout Scripture. This does not have anything to do with inferiority, but rather with a proper structure that best employs stability. When a husband or male pastor is doing his Godly work, it is a joy for a woman to submit, not a burden. That being said, women should minister and lead to the fullest extent of their divine callings. Scripture (both in the Old and New Testament) affirms women in all sorts of various roles. While it is uncommon for a woman to be in a top position of power (one example of this being the judge Deborah), women have served in a variety of other capacities including as counsellors, guides, teachers, and deacons. Occasionally, in the Scriptures and in early church history, women have taken the lead but this is almost always the exception, not the norm. Furthermore, even in a case like Deborah, the socio-historical context of the day shows us that this was not the ideal. Deborah stepped in to serve because men were not taking their proper authority and rule – it was not the best case scenario, but she followed God’s will because it was either having a female leader or having no leader. Deborah actually encouraged Barak to step up to his God ordained role, but unfortunately, he seemed to be unwilling to do so fully (by the way there are several interpretations of this. I actually wrote a seminary paper on this story, so I know at least 4 or 5 interpretations ranging from very liberal and feminist to very conservative and male headship orientated). The idea that a woman can only lead other women or children, is often taken out of context. Most Biblical passages do not suggest this (except for a few classic examples of proof-texts). Rather, women are affirmed in many areas of leadership except for top-level leadership. The women in leadership issue is a diverse and extremely tricky one within the life of the church, and one often fuelled with passion and emotion on either side of the debate. We meet “liberal” churches that discourage a distinction between men and women stating that we are all equal; some even suggesting that churches that follow male-headship are hierarchical, patriarchal, and even oppressive. These churches may even suggest that a woman must be liberated from the command to submit to her husband perhaps even stating that this design was simply brought about because of sin and was not God’s original intention: rather God created men and women as equal and thus we are all permitted to do the same things. Conversely, we meet “conservative” churches that proof-text 1 Timothy 2:11-15 stating that a woman has no right to preach or lead in any capacity except to women and kids. So who’s right? All this to say: we should guard against either extreme. A church too focused on the differences misses out on all the wonderful ways women can enrich worship and church life (whether or not she is preaching). A church too focused on the similarities, forgets that God created men and women different but equal and that diversity can be our strength rather than an oppressive driving force. Men should be encouraged to step up and lead. Rather than denying a woman the opportunity to lead, we should seek to urge men to “fill the vacuum that had previously been left by men not fulfilling their God-given leadership roles.” (Webber, 54). Webber asks the question: But what if a woman is called to a top-level leadership position? His response: Well then, she better go do it! (51) He then adds a follow-up question: what if the woman is wrong and she is not actually called to pastor? His response: Men are just as liable to hear their calling incorrectly as women and we should apply the same standards in either case: to lovingly nurture and correct this person, gently guiding them back to the Truth and helping them find ways of discerning their actual calling. After all, we cannot place God in a vacuum (although His original and ultimate design is for men to lead with authority and love, we cannot deny that for whatever reason in God’s good purposes He has sometimes made exceptions to further His plan within a given context). Malcom Webber’s book is one example of a thoughtful, tactful, Scripturally and theologically sound resource; however it is only one book and one interpretation. I’ve stated my own views on numerous blogs, but my views are constantly being formed and shaped as I become more informed and aware of the vast literature available on this topic. I’ve recently compiled a list of books on this topic from either perspective and will likely be blogging reviews as I unfold each one. In all things, my hope is that whether you are male or female, you are seeking to serve Christ to the best of your abilities, being faithful to His calling and guidance on your life, and ultimately asking yourself how you can best minister and evangelize to bring many other lost souls into His grace and mercy and for His good Kingdom purposes. 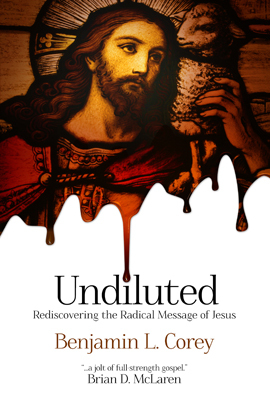 This article is part of a blog tour for the new book by fellow MennoNerd, Benjamin Corey, entitled Undiluted. You can find all the articles in this blog tour by going to http://mennonerds.com/undiluted-mennonerds. The book was received free of charge from the publisher under no obligation for a favorable review. When did you become a Mennonite? When did you start embracing Anabaptist ideals? These are two questions that I still struggle with today. On one hand, I could argue that I became a Mennonite at 16. That’s how old I was when I stood before the church, had my witnesses vouch for me, and decided that I would be part of this specific denomination. I had finished my discipleship classes, had been regularly attending a Mennonite church by that time for about a year and a half, and was almost entering into my junior (grade 11) year of high school at the Mennonite school literally across the street. However, the truth is, my quest to Anabaptism actually was a lot longer than that and nowhere near as cut and dry. It involved lots of twists, turns, and the occasional bump. The truth is, I really became an Anabaptist once I started attending Tyndale. To this day, I don’t think Tyndale – a largely evangelical and somewhat charismatic school – has any idea how much they shaped me to embrace not only a true view of Christ but also a true view of Anabaptism. This is part of the reason why Benjamin Corey’s book Undiluted really stood out to me. Corey is a fellow Mennonerd blogger and an author with a deep passion to see the North American church relive its true identity – becoming counter-cultural rather than laizze-faire. Using a simple, yet delightful approach, this book presents its readers with challenging queries and honest searches to finding out who the God of the Bible really is. For too long, outsiders have looked in on the Christian church and found it to be lacking. Accusations come from all sides that the church is too rigid, too formal, and too full of themselves. Individuals on the margins are finding the church to be exclusive, inaccessible, and boring. The culture is deeming the church to be gay-bashing, women-hating, and Islamophobic. But what did Christ actually intend for the church to become? He intended it to be built upon tradition but not enslaved to it. To be a community of believers with Christ at the center who out pour their lives in love and service to one another and to those who don’t believe. He anticipated an active, messy faith, not a placid, easy one. Corey is a brilliant and accessible author in that he is able to combine personal experience with practical theology and to make it accessible for all levels of readership. His book is fast-paced, hard to put down, and yet bears the marks of one not ashamed to be real about the questions the church has left them with. It is an enmeshment of popular theology with old school ethic; the evangelical rootedness of Christ being at the center, the only true Lord, but the Anabaptist ideals of service and mission rather than simply evangelization. There is something in this book that everyone can relate to. Whether you are finding your small group to be too surface-level and dream of deeper connections, you are a seminarian who is moving out of your denominational bubble and into a more transdenominal/ecumenical setting and it scares the daylights out of you, or you are someone who has left the church because they cannot accept where you are right now in your stage of life – this book is for you. This book is written for the doubters as much as for the seekers. For the discontented as much (if not more so) than for the complacent. It is a challenge, a warning, and a signal to the contemporary church that if we want to thrive and burn long-term we are going to have to readjust our vision, our praxis, and our spiritual climate. It is a book that has the potential to be somewhat unpopular in a day and age which wants to do away with true Christianity and instead to embrace spiritualism. It is also a book that begs to be taken seriously. It is easy for us as Christians to hear these sermons repeated over and over again at church – in one ear and out the other Sunday to Sunday. Corey’s book does not allow space or time for this. Instead, he challenges his readers that just like Christ humbled Himself, so, we too are also called to a life of service and action. There is no other way. Either you’re in or you’re out and if you’re going to be in then you’ve got to be in all the way. Thought-provoking, straight-forward, and practical I give this book 4.5 stars out of 5 and would recommend it to anyone studying ministry, currently involved in ministry, or a dissatisfied pew sitter on Sunday morning. I hope you will all go out and buy yourself a copy, but more importantly, I hope you will take the lessons and warning provided by Corey to heart as we strive to build up the Kingdom of God here on this earth.